It's Halloween weekend and we've got a preview that is full of treats and a handful of tricks also! 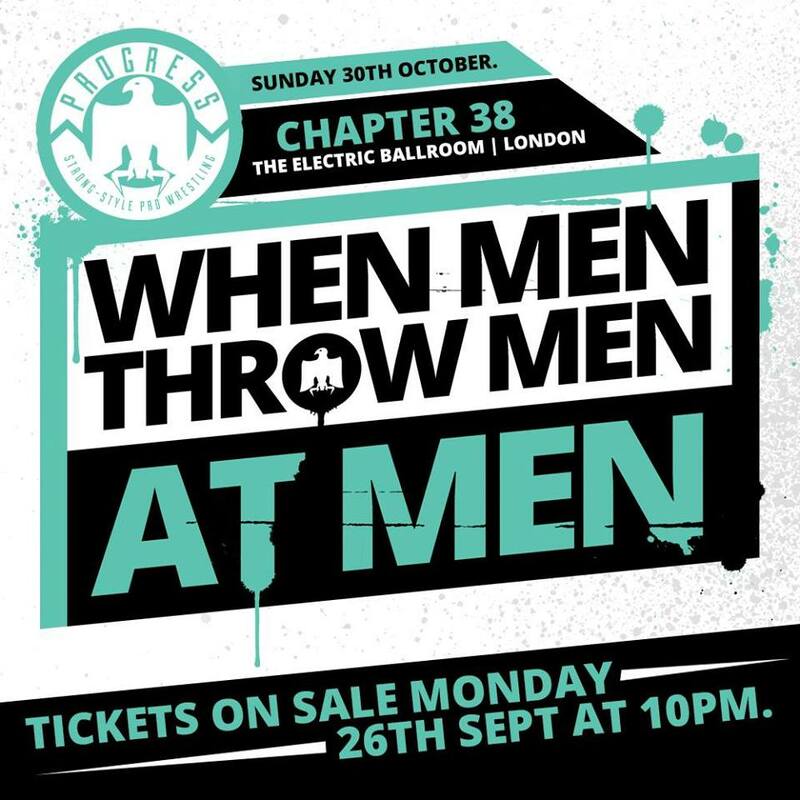 This week, we kick off on Friday with Scottish Wrestling Alliance in Paisley, Renfrewshire, before looking at Southside Wrestling Entertainment's 6th Anniversary Show in Stevenage, Hertfordshire on Saturday and then closing up with PROGRESS Wrestling's Chapter 38: When Men Throw Men at Men in Camden, London. There's little time to wait so let's get Ready For The Weekend! We've also included alternative shows across the weekend including shows in Sheffield, Preston, Southampton, Greenock, Bristol and Portsmouth! Friday night kicks off the wrestling weekend with SWA returning to The Lagoon Centre in Paisley. The event will see regular stars of SWA as well as some new faces from down south. One of the matches which will showcase both is the contest between Ryan Griffin and Soner Dursun. Griffin is the current SWA Junior Heavyweight Champion and a firm fan favourite in part for to his high-flying style. His opponent, Dursun will be making his first appearance for SWA but comes in with good credentials as his a former FSW Adrenaline Champion, a title which is comparable to the SWA Junior Heavyweight Championship. This match will be a great meeting of two young stars who no doubt will have many more championship wins in their future. Tag team action will also be on the cards this Friday night as the duo of Lana Austin and Alexis Rose will make their SWA debut when they face probably the best known Scottish female tag team today, The Bae Club's Sammii Jayne and Debbie Sharpe. All four women are known for their success as singles competitors as well as being part of their respective tag teams. The teams have never met before in the ring so it will be intriguing to witness what team comes out on top and how the personalities collide with each other. Both duos are known for maybe stretching rules of competition shall we say so the jury is out when it comes to choosing a winner. The main event this Friday is quite simply the only reason you would need to attend this event in Paisley. Joe Coffey is widely regarded as not only one of Scotland's biggest starts but one of the best in Europe, possibly the world. His opponent has traveled the world and competed for the biggest wrestling promotion on earth, WWE. Coffey's opponent at The Lagoon Centre will be Cody Rhodes. Since his departure from WWE, Rhodes has been tearing it up on the independent wrestling scene, facing legends and stars of professional wrestling at every turn. Coffey needs no promoting from us if you have even seen one match of his, you will know what he brings to the ring every time he competes. Rhodes has went on record as saying he wanted the best from SWA and they have delivered that in Coffey. This very well could be one that those in attendance look back on in years to come and say “we were there”. Also this Friday, Xander Cooper will make his SWA debut against Robbie Solar while David Devlin shall face his mentor in Mikey Whiplash. Aspen Faith will also be in action when he competes against Timm Wylie. Moving on to Saturday and SWE will celebrate their 6th anniversary as they head to Stevenage, Hertfordshire and The Gordon Craig Theatre. The event will see three of their championship defended as well as an international defence. The international defence will come in the form of Eddie Edwards defending the TNA World Heavyweight Championship against Bubblegum. Bubblegum is the current Speed King Champion but he'll be trying to add more gold to round his waist this Saturday. Edwards will not be giving up the title easily though as this is his first reign as TNA World Heavyweight Champion, which adds to his many previous title reigns which have contributed to him being a ROH and TNA Triple Crown winner. Bubblegum will not be an easy challenger to fight off though and any underestimation could result in Eddie Edwards' first reign being very short lived. Since Robbie X returned to SWE his focus has been soley on his former tag team partner, Mark Haskins. Robbie even resorted to attacking Haskins with a kendo stick during SWE last event. Haskins wants revenge and he's not going to let Robbie get away with his attack. SWE have recognised that Haskins wants retribution for the attack and have scheduled both men to face each other this weekend and kendo sticks will be legal. Robbie wants to destroy Haskins, he'll get the chance to do just this this Saturday. That being said, with kendo sticks being legal for both men, it may turn out to be Robbie who finds himself on the end of a career changing kendo stick attack at the hands of Haskins. Whatever happens expect some creative brutality in Stevenage this Saturday. The feud between Joseph Conners and El Ligero has consumed SWE for as long as anyone can remember. When Ligero's team beat The Righteous Army, forcing them to disband, many thought it was the end. However, that was not to be the case and the two men will meet once again this Saturday with the richest prize in SWE being on the line, the Heavyweight Championship. The hatred between these two men is so strong that SWE imposed a clause on their championship match that if either man touched the other before this Saturday then the match would not take place. Both men have managed to remain restrained but that restrained will be gone in Stevenage and they will have to give it all they have as this championship match shall also include tables, ladders and chairs (oh my). Only one person is leaving as champion this Saturday but we doubt that either man will able to walk away the same as they entered. This Saturday will also feature Melina defending the Queen Of Southside Championship in a six-way match against Alex Windsor, Nixon Newell, Kay Lee Ray, Dahlia Black and Toni Storm. The Southside Tag Team Championship will also be on the line when international duo of Shane Strickland and Matt Cross Stixx and Chris Tyler at The Gordon Craig Theatre. Finally, Cody Rhodes shall make his SWE debut when he faces “The Bruiserweight” Pete Dunne in the first meeting between the two men. PROGRESS return to the Electric Ballroom in Camden, London for the first time since August to present the 38th Chapter in their history, entitled When Men Throw Men at Men, with another wonderful card of wrestling lined up. The fourth Natural Progression Series kicks off on Sunday, with this edition featuring the added twist that it will be to become the first ever Women's Champion. This first quarter final match shows that PROGRESS aren't messing around, as bitter rivals and two of the promotion's most prominent females will go head to head, with Jinny taking on Pollyanna. These two have been feuding on and off since the start of 2015, having a number of tag bouts since as well as putting women's wrestling on the map in the promotion with a huge No Disqualification match in May 2015. The two have split victories in the past, but a lot has changed over the last 18 months, with Jinny developing into a much more vicious and capable performers, defeating the likes Leva Bates, Toni Storm and Mishca East. She'll be looking to use her increased experience to finally put the plucky Pollyanna down for good, but with so much on the line, it won't be an easy task. The issues between The South Pacific Power Trip (TK Cooper & Travis Banks with Dahlia Black) and The Shirtlifters (Jack Sexsmith & Roy Johnson) have been rumbling since the Summer, when Johnson would be pulled into Sexsmith's feud with The SPPT during a Wasteman Challenge in July. Sexsmith's choice words for the group who he'd had problems with for sometime, only added more fuel to fire and the two teams have been scrapping ever since. This Sunday, they'll look to put the rivalry to bed in a fan-voted Tables Match. The gimmick would seem to favour the more heinous The SPPT, who have been on a major role since joining up in PROGRESS. With Sexsmith in particular seemingly stepping outside his comfort zone, we could see a very different side to the Sexually Frivolous star on Sunday, as he and Johnson aim to put Cooper and Banks through a table. Expect shenanigans and excitement as the two popular teams collide in the Electric Ballroom. In a huge international encounter, former World Champion Mark Andrews and Matt Cross will go toe to toe with a change to face Mark Haskins for the SMASH Championship on the line. Cross is best known for his work as Son of Havoc in Lucha Underground, showing an ability to wrestle in a variety of styles and that sense he'll be more than a match for Impact Wrestling star Andrews. If you've ever seen a Cross or Andrews match over the last few years, then you'll know exactly what to expect here and if not, then prepare to have you mind blown by an aerial assault, that will be action-packed to say the very least. The two previous met during a ten person match at Super Strong Style 16, but have never faced off one on one anywhere. Mandrews picked up big victories on PROGRESS's shows with SMASH in Canada, whilst Havoc has gone undefeated in his last four bouts in the Canadian company, so this match is finely balanced to create a real battle for the title shot, which could also open up opportunities within PROGRESS itself. Elsewhere on the show, Rampage Brown will put his Atlas Championship on the line in an open challenge, The Hunter Brothers (Lee Hunter & Jim Hunter) return to take on the debuting team of Alexander Henry & Jason Prime known collectively as The New Nation and Pastor William Eaver faces Paul Robinson.